Over the years I have been collecting a fair amount of more or less obscure and less well-known or successful Trading Card Games / Collectible Card Games. There are some hidden gems to be uncovered and what is more, you can get some great games which did not make it in the shadow of powerful competitors on the contested market of TCGs/CCGs such as Magic: the Gathering and Yu-Gi-Oh! Well, well, well – Wizards of the Coast’s “answer” to the Yu Gi Oh craze in the early 2000s, or, as some might say, a blatant rip off of said extremely popular game. Like in Yu-Gi-Oh! there was a manga first and then in 2002 the TCG and Anime cartoon show obviously aiming at the same target audience as the much more popular Yu-Gi-Oh! TCG was released. And yeah it was all about some kids having to collect all the cards to save the world from utter destruction. Sounds somewhat familiar (if you are familiar with the Yu-Gi-Oh anime, which I still detest to the very day even as I enjoy the card game while avoiding the TV-show wherever I can). Anyways I got myself a few starter decks to give this one a fair chance and must give them credit for coming up with a great twist on the resource system which I have borrowed for some of my games as well. I am not sure but this is the first game I have seen doing this, but what is really great about the resource system in Duel Masters is that every card in your hand can be played upside down as one resource of its type. This is what I call a “resourceless resource system” and works greatly on so many levels, as you will never run the risk of having the wrong, too many, or too few resources in hand. Also, without dedicated resource cards that do little to nothing else than providing what is needed to play other, non-resource cards there is more room in your deck to fill out with more exciting and useful cards! I like that and have to give Duel Masters credit for an awesome twist on how resources are played. One more thing that I like about Duel Masters game-mechanics-wise is that you are actually rewarded if the opponent has the upper hand as the goal of the game is to destroy all opponent shields (5 face down cards from your deck) and when one or more of your shield cards is destroyed you are allowed to add that card to your hand. This one might just be one of the hidden gems I mentioned above. Released soon after Magic: the Gathering saw the light of day, it Wyvern TCG, although offering a very unique game system totally different to M:tG, never really took off in the shadow of the rapidly growing and tremendously popular Magic TCG. After having bought a box of Wyvern cards cheaply from a nice chap on Boardgamegeek and having only played once so far, I can safely say I really like this one. First of all it has that old-school, nostalgic touch, look and feel to it and features, at least in my personal opinion, amazing artwork done by a single artist (an awesome effort for one artist to illustrate a whole game with all expansions of several hundred cards) who has a very unique style – thus it is a matter of taste if you like the looks of Wyvern or not and I might imagine that some, like myself, would love it and some would hate it. It is definitely a very different look from anything else out there while one might argue that it cannot compete with the stunning visuals of contemporary/modern TCGs. Gameplay-wise, Wyvern features a well-conceived game system totally unlike Magic: the Gathering with what I can say is some great strategic depth which I would need to get in more plays for to fathom. Maybe the most fundamental difference to Magic: the Gathering is that you do not slowly (or rather quickly with some decks) build up resources (mana) but start the game with a “war-chest” of a number of gold pieces with which you can buy dragons (yes, all Creatures in Wyvern TCG are Dragons, which is fantastic for a dragon fan like myslef) and pay for the costs of other cards. There are some very tough and tactical choices involved in how you spend your gold, cards that gain you more gold being a rare commodity and rather exceptional, and you would rather spend your gold wisely and not all at once early on. Overall I must say that I am happy to have this one in my collection and MUST try fo find time (and a willing opponent) to try this one out some more. Another kids TV-show / Anime, another TCG for it! I never watched the Dinosaur King Anime and I don’t really care about it to be honest but as I am a huge fan of Dinosaurs (just check my game http://www.biomechanicdinobattles.com for instance) I was willing to give the Dinosaur King TCG a try and got myself a starter pack, four fancy tin boxes (never can have enough of those!) and a few booster displays incredibly cheaply off of ebay. I must say, the game is not a bad one as it is, just a bit too basic for my taste even, and I like light games in general. This one is a bit too light even for my taste – simplistic you might call it. Well maybe that is because its target audience are fans of the TV-Show, kids and youngsters. That being said I can wholeheartedly recommend this to parents if they are looking for a good and cheap TCG for their children to enjoy (not that I want to encourage parents to get their kids hooked on TCG early on!). There is a huge variety of cards (although, and this kinda killed the game for me, there is not a huge variety of different mechanics and abilities and everything starts to become quite repetitive even with the expansions) and you can play a ton of different dinosaurs, some of which even I, a dino expert, had not heard of before. The artwork is colorful and quite good as well. Again, this gets my approval as a gateway game for children! This is the oddball game in this here my list. As you can see in the above image, one thing about Hecatomb just jumps at you as something never heard of or seen before. Instead of coming in the form of little rectangular pieces of cardboard, Hecatomb cards are pentagons made out of translucent plastic (which is of a very good material for shuffling etc as I have to mention here) with the card text and image printed on. This is really unique and has not done before or after as far as I know. Now they really made use of this most unusual format the Hecatomb cards come in as the edges of the cards are kept translucent and you can (and must in order to attack) stack multiple “Minions” onto each other to create “Abominations” that share the cards’ power values and the abilties printed on the cards’ borders. So the more Minions you have in one Abomination, the stronger it will be and the more abilities it will have. In the above example you can see an Abomination with 3 Minions in it which has a combined power of 9 and several abilities such as Survivor 2, Greed and Evader (the abilities are described in the rules booklet). Well I have to correct myself on something I wrote earlier in this post: Actually, Hecatomb had that great twist on the resource system I mentioned above, the “resourceless resourcesystem” way before Duel Masters actually. In Hecatomb, you can play any card in your Resource Zone as one resource of its color. Unlike Dinosaur King, I don’t recommend this for children as the art and theme, while being just awesome for an ungodly fellow like my humble self, is quite literally sinister and nightmarish. You are going to summon the dark denizend of hell, even the Great Cthulhu for example, to reap the souls of the mortals. Who is the first to reap 20 souls is declared victor. A hellish game! Hope to find someone to play this some more soon! My younger sister Nora is totally into Animes and this very popular one is one of her personal favorites. Of course every Anime, as it seems, needs its own Trading Card Game, so Naruto is no exception. As far as I know there are even two different games, one for regular Naruto, where the main characters are still kids, and one for Naruto Shippuden (I hope I spellt that right – my sister will kill me!). Well I am not as big of a fan of Naruto as my sister but as she really loves both the manga and the anime, I got us two starter decks some while ago. Sadly, my sister is not so much into playing card games so this one is still unplayed but could be interesting from what I gather from the reading through the rules briefly. A nice mechanic I noticed is that your Characters can be wounded and are then turned sideways, which give them new combat stats and possibly alternative abilities. Neat idea! Another one of the first TCGs released in the wake of the emerging Magic: the Gathering. All I know is that it is about H. P. Lovecraft’s Call of Cthulhu, which has seen many games themed after it over the course of the years. I have neither read the rules nor actually played the game, but I thought it would be a nice addition to my collection of old and/or obscure TCG. Who knows maybe it is a great game – I shall find out some day! Yet another TCG for a kids TV-Show – but oh man. What can I say about this one? Worst piece of s*** I have ever played and mechanics- and gameplay-wise the worst game among my CCGs and the worst I have played in a long time. The story goes like this: A friend of mine recommended to me “Monster Rancher Battle Card” for Gameboy Color and PS1 and I really enjoyed the simple but elegant and streamlined rules system and mechanics. Then I discovered that there was a physical Monster Rancher TCG as well and I bought two booster boxes off of amazon. I will not tell you how much I paid but know that they were not exactly cheap. Oh boy, I should have probably researched a bit more before investing in those, as to my surprise, the cards came out of the boosters where something totally different than what I had seen in the video games. It turned out that the physical Monster Rancher TCG was an totally different game than the one I had liked quite a lot on GBC and PS1. Well, not much lost, I thought and was prepared to give this one its fair chance. However it turned out that this was probably my worst investment in a long time as the rules and mechanics are so flawed that this is almost unplayable. The worst thing is how combat is handled and among other things you are forced to go through the trouble of painstakingly building an “arena” out of cards every single time you want to conduct a battle. I gave it a fair shot, wrote a review trying to focus on the bright sides but when looking back at it the gaming experience with the physical Monster Rancher TCG was a horrible mess overall. I just wonder why they would come up with and sell something like that considering they already had a solid, maybe not great but still MUCH better game system that people knew from the video games already even. It left me puzzled. Well, at least I got to play the GOOD Monster Rancher card game after all as my friend Joe from the UK kindly took screenshots of all the cards in the PS1 game and uploaded the images to a Chinese print on demand website (pirate-style) from where I could order them. Thank you Joe!! 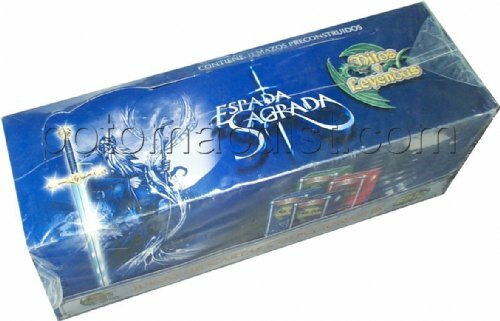 This one has a special place in my heart, being a card game from Brazil, which is peculiar, sharing a central mechanic with my own creation Elemental Clash: In Myths and Legends, your Deck is your Life and damage caused to a player leads to depletion of their deck. A player whose deck is gone loses the game. I haven’t actually had the chance to play it, but the rules for Myths and Legends seem solid and just as light as I like it, the artwork is quite great and the theme of characters taken straight out of the mythologies of all kinds of different cultures is nice. You even get to see a lot of aspects from South American mythology as far as I know – something you don’t see too often in most contemporary fantasy (trading card) games. Well, the last game on my list is another game for an Anime / Manga, but this time it is one that I have grown to enjoy quite a lot myself. One-Piece has a lot of unique and memorable, sometimes downright crazy characters and, as my sister is a great fan of both Anime and Manga, we said we could give the TCG a go. So she got me a nice, tin-boxed starter set for last christmas along with the promise to try it out soon. Well, now we have September and, alas, the game is still unplayed and I doubt my sister will keep her promise… Anyways, the game itself sounds like fun from what I was able to gather from reading through the rules once. I like how you attach your resource cards (again a game with a resourceless resource sytem) as Life Points to the Characters you play and when your Characters lose Life, you get to take the lost life point cards into your hand. Well, I might to get this to the table very soon as a new gaming buddy of mine is totally into One Piece as well and eager to try out the TCG! This Post was posted in Other Games. Bookmark the permalink.